Visit our Resources page to get a more detailed look at the text and implications of Section 114A. What does Section 114A presume? good will deter slander on the net. too much rubbish is on the net nowadays,now they have to be careful not to publish stupid articles. It would do more good than bad. I believe it took almost 10 to 12 years before it was tabled at Parliament. There many many situations to charge and prove one’s misuse of internet beyond reasonable doubt was not easy task under Sections 231 – 233 ) Communication and Multimedia Act 1998. 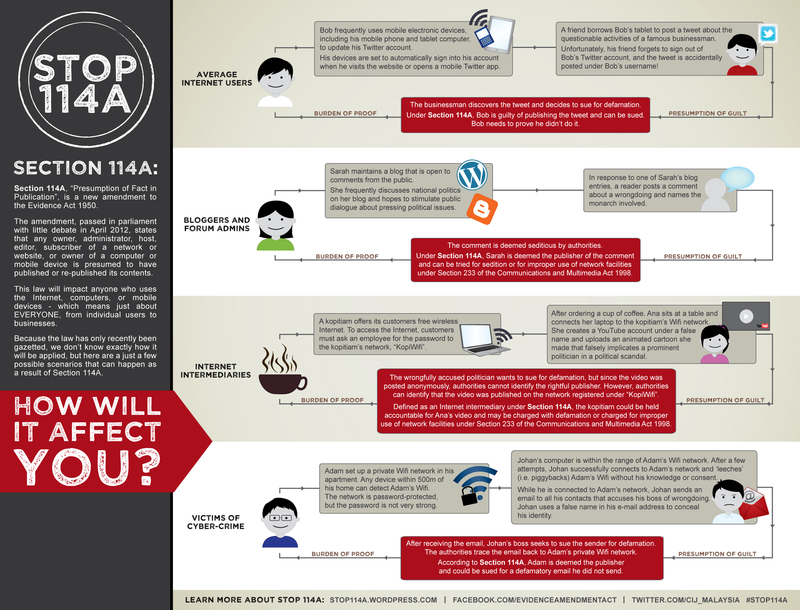 With amendment of Section 114A Evidence Act 1950 owners and users of Internet would be careful. can someone translate in malay. hei can u terjemah this to bahasa English ? Hi, We need to oppose this Bill. Reason being not democratic and We Malaysia will be lose for informations. This is the ONLY source of ACTUAL NEWS OF Malaysia. that means we can just sing praises, no complains or constructive criticisms The inferiors need syioking Guess you all know who I am talking about! I tell these people if we have no freedom WE HAVE NOTHING Handouts and donations and tall buildings do not satisfy us!!!! I think this make everyone accountable for what they say. make sure the information passed on is not false or half-truths. The worse thing about the internet is the propagation of lies to promote the agenda of some individual who hides behind the veil of anonymity. Check the facts before publishing and stop slandering innocent victim. The targets of the slander are victims too. I dont understand the above writings because its written in english and chinese. i go to cari look for info . This is as good as allowing your neighbour to sneak into your room in the midst of your love making without having to face the wrath of law anywhere ! This is officially empowered the government or politician to achieve their objectives by protecting their back, not limited to arresting any opposition parties, NGO, citizens. What sort of ‘law and regulations’ is this Section 114A? Driving malaysian people back into Stone Age and living once again in caves. UMNO/BN regime is well known for twisting facts and deliberately creating false evidences against political foes as well as social activists according to its whim and fancies. I personally confute the BN’s lawmakers to have sanctioned such amendments recently in Parliament. The Section 114A sounds to me like the Law of Jungle whereby It is still guilty until proven innocent instead of ” One is still innocent until proven Guilty”. Just another ploy from the government to stop non-supporters from attacking them in the media. It is basic human nature that you cannot stop another person from speaking against you. If you were to meet an opponent on the street and he spoke something against you, are you going to gag him? I am against Section 114A. There needs to be a standard with the law but what happened to freedom of speech….this law seems to have a fishing net approach so is designed to cover everybody. wonder why a big huha ONLY when the Evidence act has been gazetted? shouldn’t we started taking action DURING the proposal or amendment stage? not AFTER! One thing most IP businesses will do .. move overseas. That is what most will do .. so do I. We are businessmen .. not risk takers or indulge in Politics. So no way we wish to do fresh business in this country. yang terhimpit dan tersepit mula menghimpit……fahamkannnnnnnnn…..
this is a good thing. be responsible fore the service that you prepared for your customer. If you provide a blog, filter the comments. be responsible. make sure that the comments or story is true then publish it. Malaysia is the laughing stock of the world with this Bill. Our Govt and its MPs are all perceived to have a weird, depraved and warped sense of logic, to always come out with stupid Bills without giving much thought of its consequences. The Rakyat must really think what morons have we voted in!!! We paid the BN members of Parliament and Senators so much money every month and they come up with this type of lousy law? Now they are talking about reviewing it. Let us see whether Najib will still be popular with the young people after this. Were the BN members of Parliament half-sleeping when they were debating the bill in April..
Law makers need to do research, consider public opinion and look after public interests, not the interest of any political party, and individual or the hell of it!! This law is just going to make Malaysia another issue as a laughing stalk internationally! Freedom of speech??? What the hell is that?? Freedom of expression?? What is that?? Human rights??? Left or right? You choose, I decide!!! I don’t see there is anything wrong with the new web law implementation, so long as the dept responsible for the action taking how well they understand the term of action apply to the content taking place. Every nation has it own security measure I don’t see this nation any different than other, but by saying that if the Government has no trust by the people or a very corrupted government then it will be a risk to the people. Abuses of power and over exercise their authoritiese that is a big concern to people, otherwise over all is a good measure of security for kids who go online a lots surfing the forbid content. The same time this is to show the current government the reaction of people how they worry, not the new web law but is the trust they want from you. How civilize and literacy you are in running the country, they don’t want extortion nor ransom from the authorities. Actual fact I don’t see the people of this nation could do any harm to his own home land, they want the government to be more accountable for what they have done. If you can change your attitute in toward the nation I am sure you will stand the chances in winning the election. Good luck to you M’sia. Vote BN , no more Internet . It is clear that BN is in tremendous fears for the next 13th GE.Utusan daily is a biased newspaper owned by UMNO , and this was admitted by the chief editor himself.Utusan can simply makes any slandering news against any individual they like and has been doing it for more than 25 years , since Mahatir was a PM.Have you ever seen any stern action being taken by authorities against this Utusan paper ? The answer is non at all. Then why the BN goverment is so nervous to charge the internet user to the extent that even someone has used your name to publish a seditious news and yet you will stll be responsibled for the whole lies.What happens if UMNO or Utusan members hack the opposition party leaders inetrnet and make a false and seditous news and the police send them to prison untill they are found not guilty.This is a political trap desgined by UMNO-BN to entrap the opposition and reinforce the fears onto the Rakyat. No wonder party GERAKAN fully supports the admendments of section 114A in the hope that they can scare off the Penang people and take over the state in this coming 13th GE.No matter how the UMNO -BN is trying to do , my decision is change the present goverment VOTE PAKATAN. When Malaysians buy telephone/internet/hand phone…we are required to registering the number and line with the government and these law has been pass years ago. now on top of that BN and its components parties are up to our throat..